Landor Associates, one of the world’s leading strategic brand consulting and design firms, today announced the new brand for the Advertising Educational Foundation (AEF), a non-profit organization that creates and distributes educational content to enrich the understanding of advertising and its role in culture, society, and the economy. 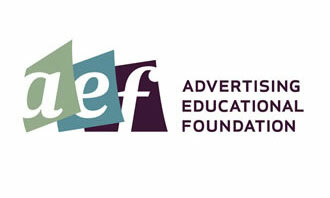 Since 1983, the AEF has sought to connect liberal arts college students and professors with advertising practitioners in order to expand and elevate the advertising discourse and help attract the highest level of talent to the industry. Reflecting the dramatic changes impacting the advertising industry through advanced technologies, stricter regulations, and rapidly expanding media applications, the new AEF brand serves to reinforce its role as a repository and enabler of advertising thought leadership. As the principal forum and conduit for discussion and debate on advertising related issues, the AEF pursues its mission by distributing peer-reviewed scholarly journals, holding annual symposiums and roundtables, and hosting online exhibitions. Additionally, the AEF offers two programs that unite the worlds of academia and business: the “Visiting Professors Program,” which places advertising and marketing professors inside agencies for a period of time, and the “Inside Advertising Speakers Program,” which invites agency and marketing executives into classrooms to share their experiences and shed light on the issues most pertinent to the industry. “I’ve worked with the AEF for nearly 20 years and am very proud of their mission and accomplishments; they bring the industry to life in classrooms across the nation, keeping even the most seasoned veterans grounded,” said Hayes Roth, Landor’s Chief Marketing Officer. “The new brand needed to not only capture the professional/academic partnership at the heart of the organization, but also reflect its evolution as a sophisticated forum for industry thought leaders. We think we have accomplished this objective and armed the AEF with the right tools to make their brand effective and relevant across all applications and mediums for many years to come.” The dominant feature of the new brand is the “Pages” signature, which depicts the richness of content and breadth of resources the AEF has to offer. The mark bridges the classic and the contemporary, giving the impression of blending traditional book pages into their more modern web context. The new brand is visible on the organization’s website, aef.com, and in a special four-page insert in the January 26, 2009 issue of AdWeek. Neuer Markenauftritt für die Volkshochschulen. Hochschule Kaiserslautern stellt neues Logo vor. A new identity for EMSCom.